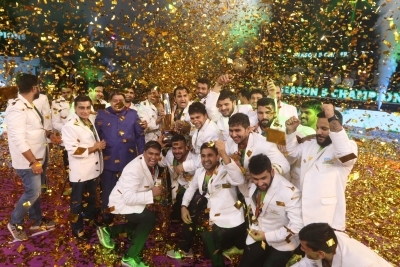 Chennai, Oct 28 (IANS) Patna Pirates thumped Gujarat Fortunegiants 55-38 to clinch the Pro Kabaddi League (PKL) season 5 title at the Jawaharlal Nehru Indoor Stadium here on Saturday. 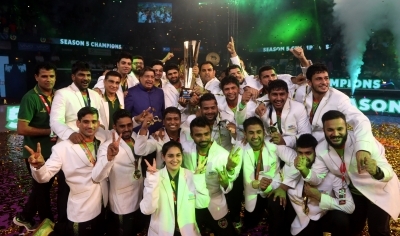 Patna have won the PKL title for third consecutive season now. Raider Pardeep Narwal (19 points) starred for Patna to single-handedly dominate the match and clinch the all-important victory. Defender Jaideep (5 points) too played a vital role. For Gujarat, Sachin (11 points) was the top scorer. Patna struggled in the early stages before a raid by Narwal levelled the scores at 15-15, and the team did not look back from there taking a 21-18 lead at half-time.